WASHINGTON -- The share of unemployed Americans who receive unemployment insurance benefits has dwindled to its lowest point in decades, thanks in part to benefit cuts in Republican-led states. Just 23.1 percent of unemployed workers received state unemployment benefits at the end of 2014, according to a new analysis by the Economic Policy Institute, a liberal Washington think tank. The rate has hovered beneath 24 percent since 2011 and bottomed out at 22.1 percent in November 2013. The previous low was 25 percent in September 1984, based on Bureau of Labor Statistics data going back nearly 40 years. The recipiency rate is low for several reasons. One key factor is that to qualify for benefits, unemployed people must have been laid off through no fault of their own from jobs they had held for a significant period of time. Among those who aren't eligible are workers who were fired for misconduct, people who quit their jobs, new college graduates looking for work, and people unemployed for a really long time. So-called "job losers" constituted just 49.2 percent of the 8.6 million unemployed in December last year, down from a peak of 65 percent in 2009. As EPI's Will Kimball and Rick McHugh report, there is another significant reason that fewer workers receive benefits these days: States have cut back. Before the Great Recession started in 2007, all states offered 26 weeks of benefits intended to replace a portion of a layoff victim's lost wages. Per its custom in every recession since World War II, Congress began giving workers extra weeks of federally funded compensation, pushing the combined duration of state and federal benefits to 99 weeks until 2012. The extra-long duration of jobless aid contributed to a backlash at the state level, where Republicans sought to chip away at the initial 26 weeks. In eight of the nine states that have cut benefits, the unemployment insurance recipiency rate has fallen faster than the national average, Kimball and McHugh report. Though their analysis focuses on state-level data, they note that when recipiency of state benefits fell to 25 percent in 1984, federal benefits were still available, unlike today. Congress let federal benefits expire at the end of 2013. "A smaller percentage of unemployed workers is receiving unemployment benefits than ever before," McHugh said in a statement. “Because there were no federal benefit extensions in 2014, workers who exhausted state benefits had less protection from the harm caused by unemployment than any similar cohort of jobless workers since the late 1950s -- when Congress first began benefit extensions." 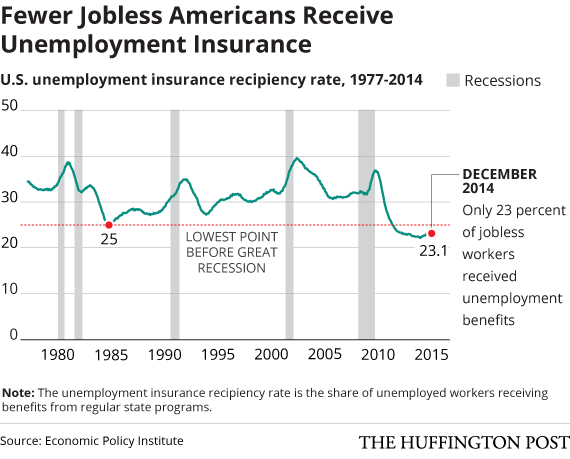 As of December 2014, only 2.4 million Americans were claiming unemployment benefits. The Bureau of Labor Statistics has noted in the past that the number of those who have claimed benefits for a particular period is generally higher than the number who ultimately receive such benefits, the group on which EPI focused. HuffPost readers: Struggling to get by even though everybody says the economy's getting better? Tell us about it -- email here. Please include your phone number if you're willing to be interviewed for a story. Lisa Millard of Las Vegas told HuffPost in July 2014 that she has been out of work since April, when she was let go from her job as a poker supervisor. Read her story <a href="https://www.huffpost.com/entry/working-poor-lisa-millard_n_5627747" target="_blank">here</a>.